This forum is compiled by Dr. Peter Jenniskens, SETI Institute. Please report errors to our mailbox. Keep in mind that the look angles for the entry trajectory are extremely sensitive to small trajectory changes. There are two targeting maneuvers yet to perform (on 5 and 14 Jan), and up to two contingency maneuvers (which will not be used if all goes well). Data will be updated when better information becomes available. Some results pertain to older trajectory versions. Keep checking for changes. And let us know about your results [WE NO LONGER ACCEPT OBSERVATIONS]. If you've ever gone out to watch meteors, you know how unpredictable they can be. You never know when and where one will show up. With the Stardust mission returning it's comet samples and reentering at the highest speed of any man made object, you'll be able to know exactly when and where to see this amazing man made "meteor". As it stands, the capsule will enter Earth's atmosphere (135 km altitude) at 09:56:39 UT on 2006 January 15. That is Sunday morning 1:56:39 a.m. PST in California and Nevada. 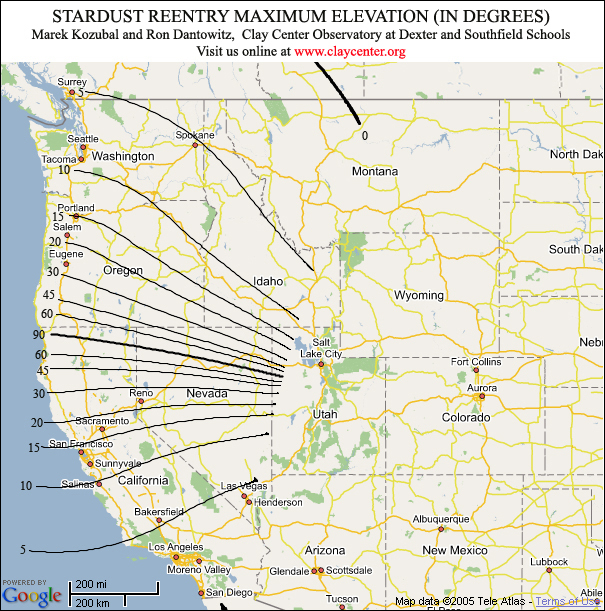 If you live in the Northern California, Oregon, Washington, Northern Nevada, Southern Idaho or Western Utah you should be able to see some part of this man made meteor. 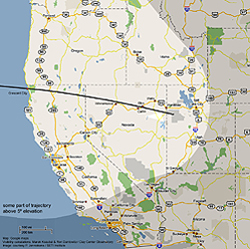 The closer you live to the trajectory, which runs from Crescent City, to Mt Shasta, Cal and then through Winnemucca and Elko Nev, and finally to Western Utah, the higher in the sky it will be. This figure shows the highest elevation of the SRC above the local horizon from different sites. Lines were calculated by Marek Kozubal and Ron Dantowitz of the Clay Center Observatory at Dexter and Southfield Schools (map courtesy Google maps). Click on picture for a larger version. Not only can you just go outside and just watch, you can take video or pictures, for showing friends and family and posting to the web. If you let us know about your intent to observe the Stardust SRC entry, you become part of the observation team and you can help the scientists study the reentry contributing your photos or video to NASA. While the primary mission of Stardust was to collect comet samples, NASA is also using the reentry to collect other useful scientific data. The Stardust Reentry Capsule (SRC) is of a known material, coming in at a predicted time, direction and speed. It's a great "calibration target" for scientists to use for comparing the data they get from meteor observations. As the plans for manned exploration of the Moon and Mars progress, reliable heatshield materials are needed to return the astronauts safely back to Earth. How the SRC heatshield reacts to the high velocity will help in determining if it is the right material for these future missions. 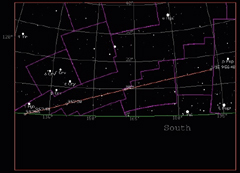 Observing requires knowledge of the times and travel path of the spacecraft. Finder charts for selected cities are available below. If possible visit your planned observing site beforehand to ensure there are no trees, buildings or other objects that will block your view. This is especially important if the SRC will be close to the horizon as it passes by. The maps give you a general idea of the direction and elevation. 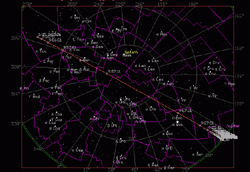 If a finder chart is available for a site near your location it will provide a more precise estimate of the reentry path with respect to the stars and compass direction. 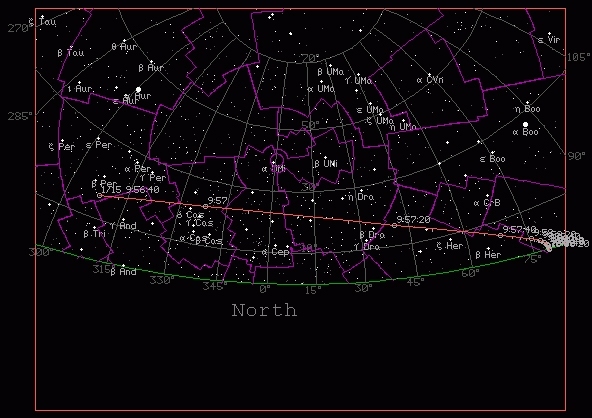 Look for the pattern of stars shown in the finder chart to orient yourself. 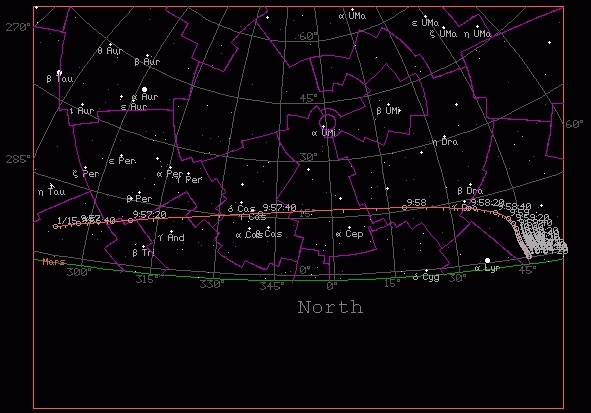 North is 0 degrees azimuth, East is 90 degrees azimuth, South is 180 degrees azimuth and West is 270 degrees azimuth. Your hand from fingertip to wrist, when held with you arm straight away from you body is about 15 degrees in size ,so can be use to measure azimuth and elevation from known directions. If the SRC never gets very high above the horizon, binoculars can be helpful in finding and following it. 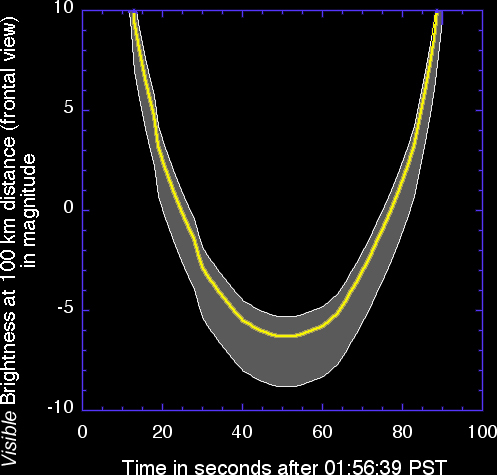 This graph shows where one could hope to hear the sonic boom of the SRC entry, using "PCBoom4" software from Wyle Labs. Different colors mark the areas with certain loudness. 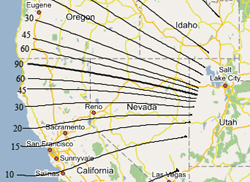 Click on map for overall view of locations. Even if you know you cannot see the reentry due to obstructions or clouds, it is perhaps possible to hear the sonic boom "rumble" if it is not too far away. It takes sounds about 1100 feet/sec (300m/s) to propagate to the ground; thus if Stardust is 200,000 feet (60,000m) away from you at its closest distance during reentry along your line of sight, it would nominally take around 96 seconds for the sound to reach your ears AFTER the SRC has passed that point. For the human ear to detect the boom(s) you should be far away from noises, especially traffic noise. For nearby observers, the boom is expected to be just loud enough to be recorded on camcorders. Make sure that the microphone is shielded from the wind. Boom levels are highest just west of the point of peak brightness, and do not exceed 0.05 psf. 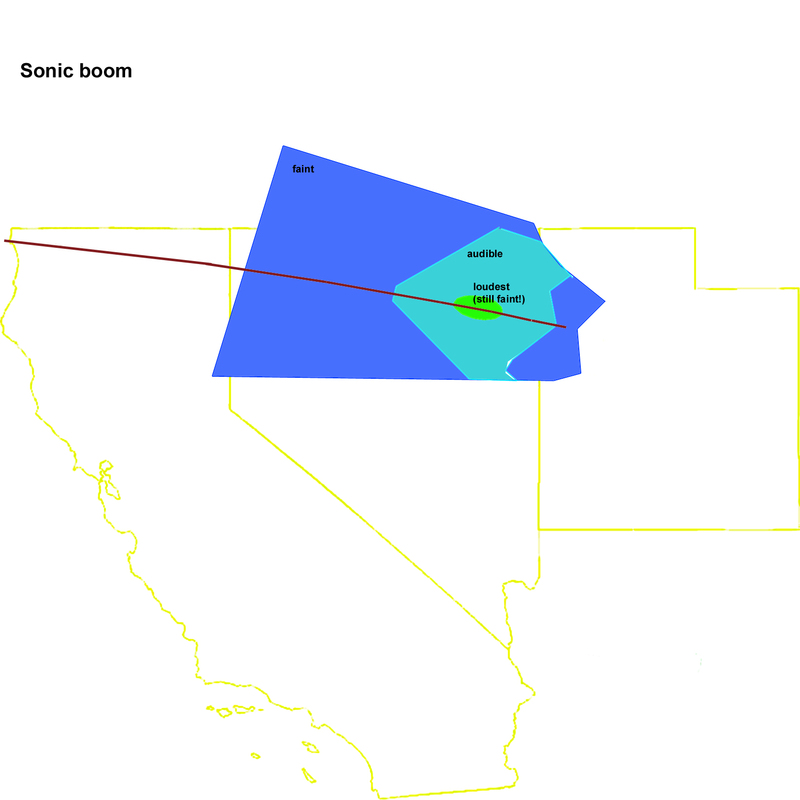 The Genesis sonic boom was recorded at 4 Pa (0.08 psf) and was loud enough to be heard and recorded on camcorders near the point of peak brightness. Stardust would be just a little less loud than Genesis. As long as there is no thunder, a passing storm should not interfer with the sonic boom observations. Cloudy weather does not affect the sonic boom adversely. The boom will be louder if it is wet. The following graphs show the view of the stardust SRC against the star background from different locations, courtesy Jim Albers of San Jose. 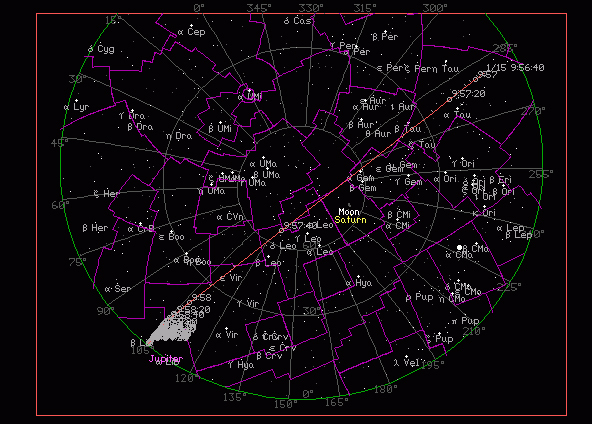 He used SkyMap version 6.5 by Rob Matson. Note that times are uncertain by +/- seven seconds. Click on picture for larger view. Feature story about where to go to watch the re-entry. 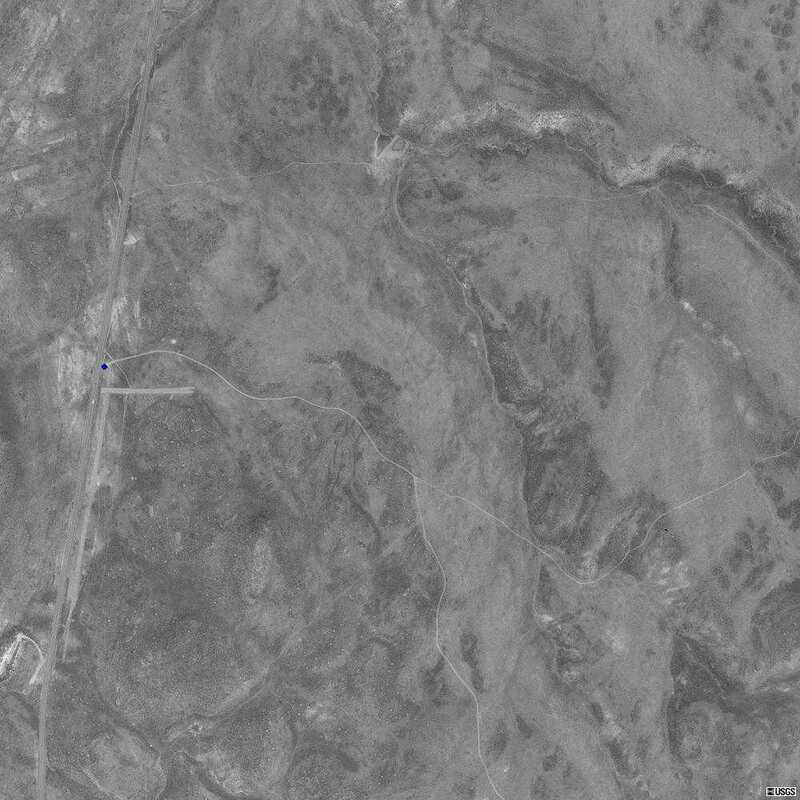 Note that the SRC is expected to be bright mainly on the front side of the capsule, so you want to put yourself at a site where the SRC is seen to be approaching (e.g., East of Carlin, Nv). The graph above shows brightness estimates, converted in units of magnitude by Peter Jenniskens, calculated from intensity spectra by Joseph Olejniczak and Michael Wright of NASA Ames Research Center. 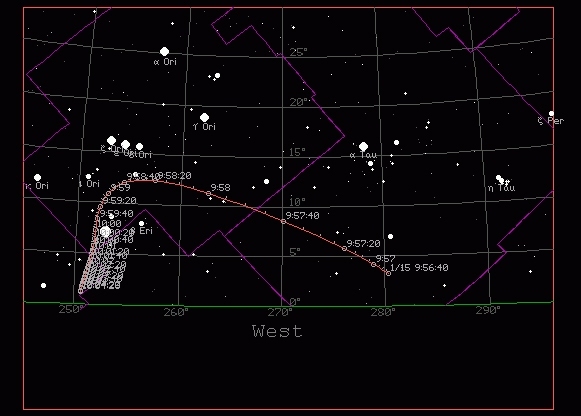 The graph to the right shows the visible magnitude of the SRC as a function of time along the trajectory for a viewer that is 100 km away from the SRC and having a frontal view seeing the SRC approach. This brightness estimate includes only the hot surface, no air plasma emissions. 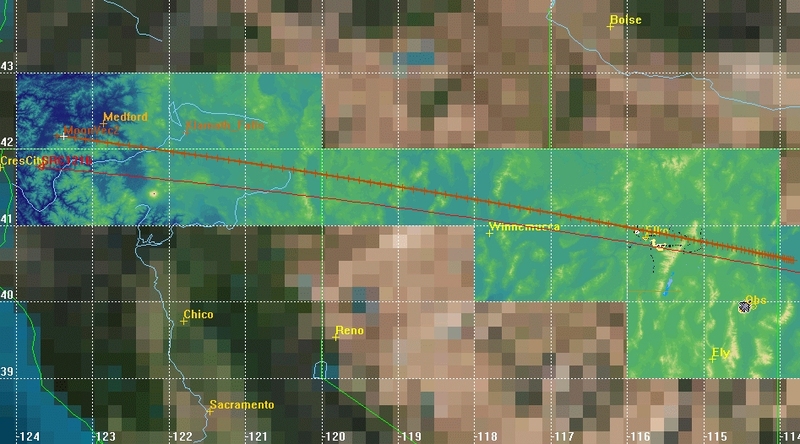 Early on in the trajectory, the object could be quite a bit brighter than shown (observers in California and Oregon should look for visible luminosity when the SRC first interacts with the atmosphere, starting at around 200 km altitude). The brightness decreases with the square of the distance according to dm = 5 * 10log (d (km) /100). 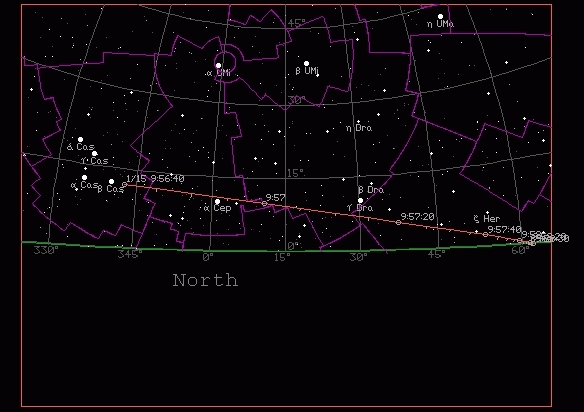 If you are 200 km away, then the SRC will appear 1.5 magnitude less bright. At 500 km, that is 3.5. magnitudes. Click on picture for larger version. 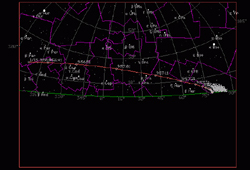 SRC is bottom red line, Moon crossing path on ground is upper orange line with crosses. 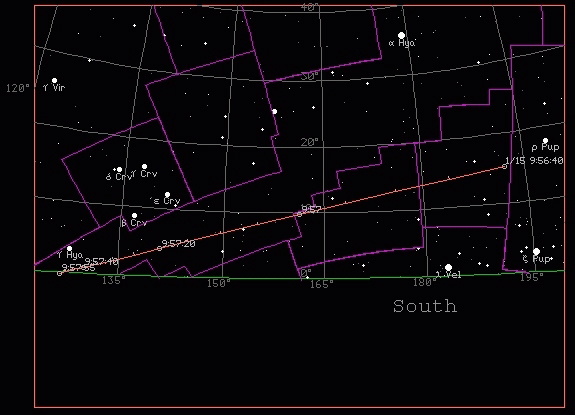 The width of the occultation area is about: distance to SRC times tan(0.5 degrees). However, keep in mind that the trajectory is still uncertain and the optimum line may shift by many kilometers after the next targeting maneuvers. Check for updates. Click along trajectory for 1x1 deg zoom or anywhere else for large image. 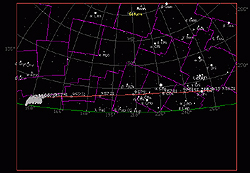 File of latitude, longitude, altitude points of Moon crossing path. 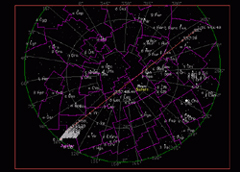 The near full Moon (99.1 percent illuminated, V = -12.65 magnitude, 30.02' diameter) will be in Gemini at about 66 degrees elevation at the time of the reentry in a south-western direction (Azimuth about 231 degrees). 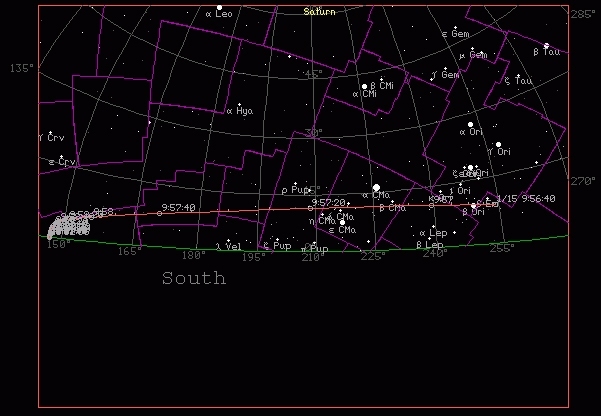 The SRC should appear in front of the Moon if you are located along the orange crossed line in the figure above (created by Jim Albers using STK, click on image for larger version). If the SRC is seen to pass near the Moon, you may see the trail of hot air in the wake of the SRC drift by the Moon some time later. Use a telescope and polarizing filters to bring out features in the wake. The capsule itself is very small, only about 2.5 arcseconds in diameter, depending on altitude, moving by the Moon in just a few video frames. More easily observable, perhaps, is the hot air in its wake. 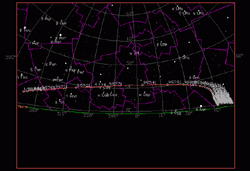 The turbulent hot air is expected to scatter the Moon light and the trail may appear as a dark line for viewers who aim their telescope at the Moon. The trail is expected to develop billowing and split in two, then drift in the upper atmosphere winds (which are expected to be mostly from West to East). These overview maps provide guidance about where the SRC will cross the Moon and should be used with a topographic map (see below) and trajectory plotting software like Skymap to determine the exact location at the local altitude. The observing location should then be surveyed beforehand during daylight using a GPS to ensure there is legal access and it is a safe location. 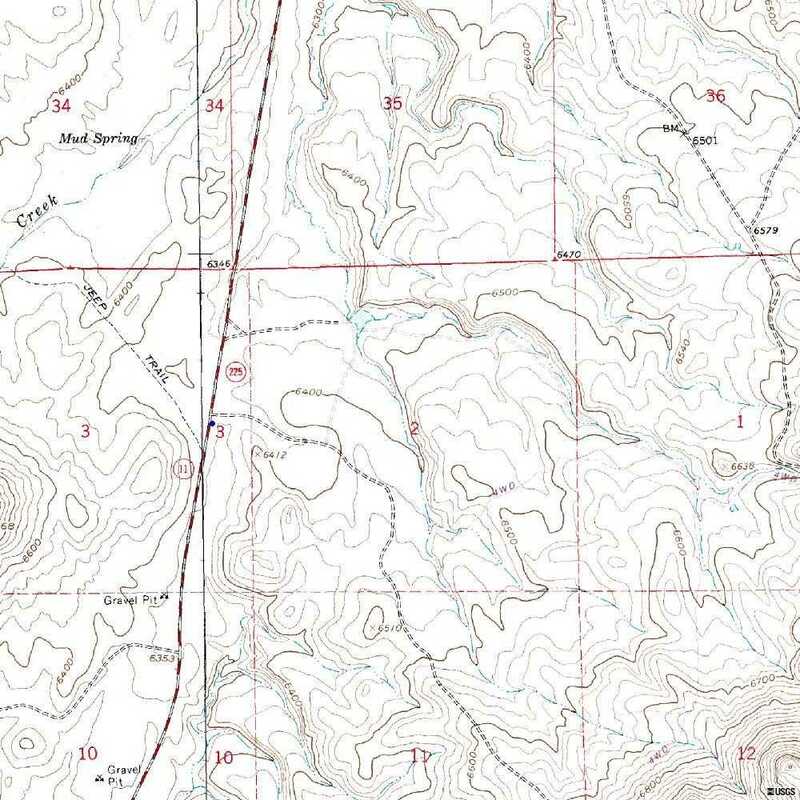 Example location north of Elko on Hwy 225 is (40.9506,-115.8753, 6360 ft): Topo-4m, Aerial Image-2m, Google Maps, Skymap view. Even though they will be a significant distance away (approximately 200,000 km at 0200 UTC 1/15/06), with a medium size telescope and CCD you might be able to capture some images of the SRC and spacecraft together on the last two nights before reentry. The JPL Horizons system provides RA and Dec that can be plotted using Skymap (by inserting it into the Deepsky.txt file) or any star map. 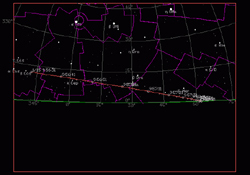 Set Target Body to "Stardust (bus) Spacecraft" and set Observer Location to your position. Fred Bruenjes captured images of the Genesis spacecraft while it was approximately 282,000 km away before reentry last year. AVI video animation with look angles, courtesy of Jim Albers using STK. The circles marked "10.000" and "20.000" are locations from where the capsule has a 10 degree elevation or 20 degree elevation, respectively. 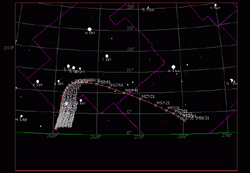 The January 14 post TCM19 latest trajectory of the Stardust reentry (courtesy of Prasun Desai of NASA Langley). The timing is now uncertain by +/- 0.6 seconds. 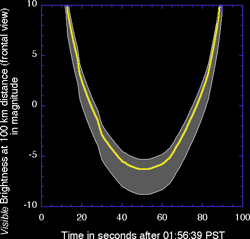 The older Stardust SRC entry nominal trajectory as per best estimate on December 6, 2005 (courtesy of Prasun Desai of NASA Langley). The timing is uncertain by at least +/- seven seconds. 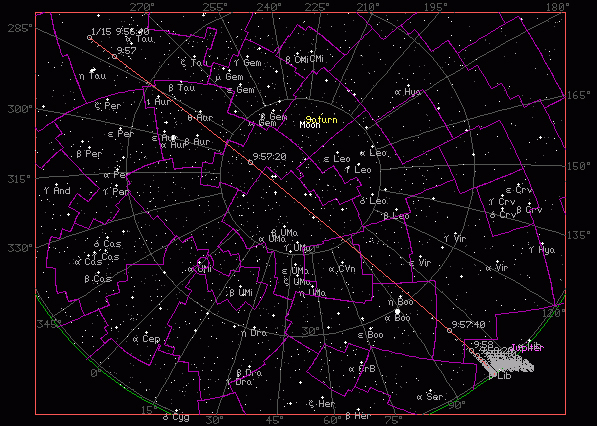 Trajectory in Skymap format, set Map Time to 09:56:40 UTC. There are many good websites with weather charts and satelite images on the internet. Predictions for clear weather conditions at night in the state of Nevada can be found at Clear Sky Clocks in Nevada (courtesy of Attilla Danko and Dave Holman).